Take to the seas and see Puerto Vallarta as it was meant to be seen aboard this exclusive PRIVATE 40' Catamaran. Perfect for whale watching trips, visiting the Marietas Islands, snorkeling trips, sunset cruises, even party oriented booze cruises! 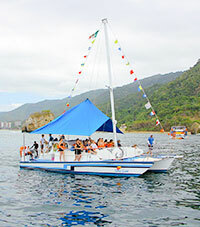 Up to 45 people can enjoy cruising the coastal communities around Puerto Vallarta. With spacious front netting, shade, and a fun-loving crew available to serve you drinks all day long, this catamaran is perfect for groups of all kinds. We can visit the faraway beaches of Quimixto, Las Animas or Yelapa, snorkel in the hidden cove of Colomitos, or watch for whales and dolphins (in season).. This popular catamaran is available for private charters, snorkeling trips or you can take it for our regularly scheduled whale watching tour if you have a smaller group. Cruise Passengers: This excursion is flexible to fit all cruise ship schedules. Pick-Up is available from most piers. Duration: Available for 4, 6 or 8-Hour Trips. Length Public Price Our Price You Save!